Cargo airlines (or airfreight carriers, and derivatives of these names) are airlines mainly dedicated to the transport of cargo by air. Some cargo airlines are divisions or subsidiaries of larger passenger airlines. Larger cargo airlines tend to use new or recently built aircraft to carry their freight. However, many still utilize older aircraft, including those no longer suited for passenger service, like the Boeing 707, Boeing 727, Douglas DC-8, DC-10, MD-11, Airbus A300, and the Ilyushin Il-76. Examples of the 60-year-old Douglas DC-3 are still flying around the world carrying cargo (as well as passengers). Short range turboprop airliners such as the An-12, An-26, Fokker Friendship, and British Aerospace ATP are being modified to accept standard air freight pallets to extend their working lives. This normally involves the replacement of glazed windows with opaque panels, the strengthening of the cabin floor and insertion of a broad top-hinged door in one side of the fuselage. Antonov An-225 Mriya and Antonov An-124 are the world's largest aircraft, used for transporting large shipments and oversized cargos. Usage of large military airplanes for commercial purposes, pioneered by Ukraine's Antonov Airlines in the 1990s, has allowed new types of cargo in aerial transportation. In the past, some cargo airlines would carry a few passengers from time to time on flights, and UPS Airlines once unsuccessfully tried a passenger charter airline division. European Air Transport (EAT) Airbus A300B4F. 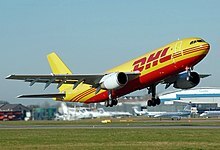 EAT is a subsidiary of DHL Aviation, one of the world's largest cargo airline companies. ^ Bartsch, Butsri (24 May 2013). "Air freight - it could not be faster!". BB Handel. Archived from the original on 2013-06-07. Retrieved 29 May 2013. ^ "Chapman Freeborn charters first AN-225 to South America". Chapman Freeborn Airchartering. ^ "Argentina's First Satellite Delivered on AN-124 Cargo Charter". Chapman Freeborn Airchartering. 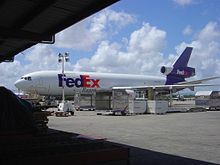 ^ a b "World's 50 largest air cargo carriers in 2014: FedEx leading the way". Air Cargo News. 15 September 2015. Retrieved 25 March 2016. 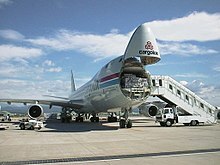 Wikimedia Commons has media related to Cargo airlines.